The Littmann Master Classic II™ is a simpler edition of the Master Cardiology model. It comes with the same design like that model. Its ergonomic design allows for excellent acoustic precision. The Master classic Litmann stethoscope comes with a single-sided chest piece that is designed specifically for treating adults. 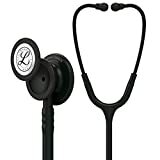 Like other models of the Littmann series, this one also comes with a dual-frequency diaphragm that can be tuned. In a few words, this model is powerful in performance and is also inexpensive. It is the perfect option if you do not need to bother about high-level acoustics performance, and can let go of the pediatric chest piece.